Welcome to 4x4TrailMaps.com. We offer the details you need to help find and navigate the back country trails. We are constantly updating the site with trails from coast to coast. While we strive to deliver the best information available for each trail ourselves, we cannot run every trail. If we cannot provide you with the best information we will show you where to get it. You may notice some changes taking place around the site. It is the result of all the hard work over the last few months. While the site will look the same for the most part how it works under the hood has completly changed. These changes will allow trail information to be easily accessed and cut down on us having to input the same data over and over again for different sections of the site. This will allow us to update the site and add new trails more easily. While we are going through these changes and populating the new site you will have access to both. Thank you for your patients and check in on the new trail map index for new trails and additional features. Scroll down just a little more to see our newest feature. We have added elevation profiles to the trail write-ups just below the interactive trail map. Well it's here! We will be constantly updating our list of local 4x4 clubs. If you do not see your club listed let us know and we would be happy to add it. It is our goal to keep you informed about four wheel drive trails as well as groups in your local area that share the same passion. By joining a local club you will not only meet some people in your area that share an interest but you will meet people that have a wealth of knowledge and a helping hand when you are working on your latest project. E-mail us at ClubRequest@4x4TrailMaps.comto add your club to our site. 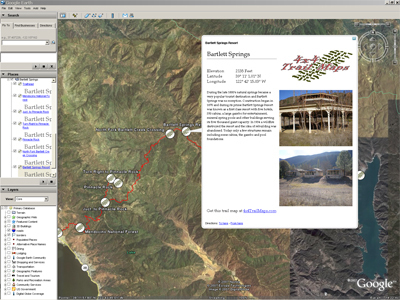 As a complete mapping solution 4x4TrailMaps offers Google Earth mapping files! Each trail contains way points, trail outline, photos, and descriptive information about the trail. Look for the link to the Google Earth File under the download section of each trails page. Simply click the link to view the trial within Google Earth! Don't have Google Earth? Follow the link below to download your free version.